The classics never die away, which is proven with the 2018 release of Robin Hood. The age-old tale of has been revamped and reimagined. At the beginning of the movie, the familiar Robin Hood, played by Taron Egerton, is drafted into the war. He leaves his lover, Marian, played by Eve Hewson, in order to answer the call to action. He later becomes disillusioned with the idea of the crusades after he fails to prevent an execution and returns to his home. Upon his return, he learns that the king had declared him dead in order to sale his land, fuel the war, and push people into working in the coal mines. 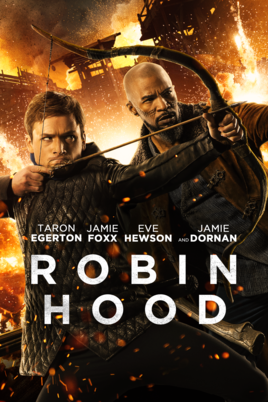 Robin Hood teams up with John, played by Jamie Foxx, and the pair becomes the head of an elaborate plan to steal money from the English crown and returning it to the people. This version of Robin Hood is full of action and it does something that no other Robin Hood film has attempted to. The director, Otto Bathurst, makes the film seem like it is in multiple time periods at once by adding a touch of modernism into small things, such as the clothing. Also, the film’s scenes are vivid and beautiful. The fight choreography is also something that added to the film’s overall success. Although this Robin Hood is different than the versions that many of us grew up knowing, the 2018 Robin Hood succeeds in everything it needed and wanted to do.